Do what you are doing. Other translations include: "Pay attention to what you are doing. ", i.e. "Concentrate on the task at hand." or "Attend to the work you have at hand." 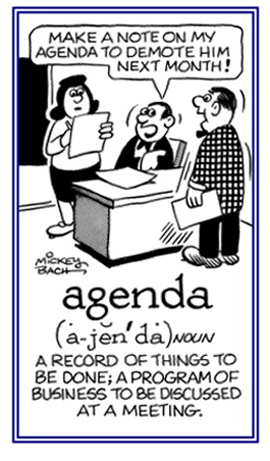 Things to be done; such as, a memoranda of items to be considered at a meeting: Agenda was the plural form in the original Latin, but now is often used as a singular in English, in the sense of "list"; and followed by a singular verb. 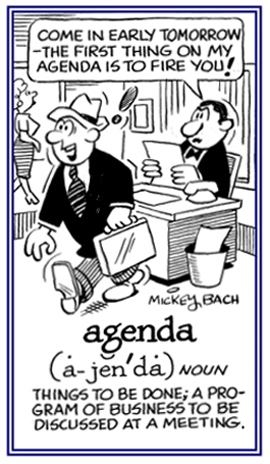 So well established is agenda as a singular that "agendas" is now commonly heard and seen as the plural form; however, the correct Latin singular is agendum; as, The agendum is whether the teaching staff wants an extended school year or not. The agenda have been established for the next business meeting. A medical or prescription instruction. Alenda lux ubi orta libertas. Where light has arisen there liberty should be sustained. Motto of Davidson College, Davidson, North Carolina, USA and Community College of Beaver County, Monaca, Pennsylvania, USA. Speaking the truth in love. A transliteration of the Greek motto of Brandon University, Brandon, Manitoba, Canada. Another way must be tried. This strongly suggests that someone's present efforts will prove fruitless so, "We must go back and try another approach." "Samuel Langhorne Clemens, alias dictus was Mark Twain (1835 - 1910), who was an American author who wrote The Adventures of Tom Sawyer among several other novels." 2. Etymology: from Latin alias, "otherwise, at another time". Also from Latin dictus, the perfect passive participle of dico, "to say". Aliena vitia in oculis habemus; a tergo nostra sunt. Another's faults are before our eyes; our own [faults] are behind us. Expressed by Seneca, in his writing titled, On Anger. I fly with my own wings. State motto of Oregon, (1848-1858) U.S.A.
Aliquis in omnibus, nullus in singulis. A somebody in general, a nobody in particular. Another version is, "A jack-of-all-trades, master of none." A description of someone who may have several general skills, or areas of knowledge, but who is not an expert in any of them. Aliud corde premunt, aliud ore promunt. One thing they conceal in the heart, they disclose another with the mouth. Another version is, "No use trying to keep a secret." A warning that when more than one person knows something, it is no longer a secret because there is usually someone who will talk about it. Translation: "Desire persuades me one way, reason another. I see the better and approve it, but I follow the worse." From Publius Ovidius Naso (43 B.C. - c. A.D. 17). Showing page 13 out of 21 pages of 303 main-word entries or main-word-entry groups.